LOVE the hexipuffs! I have dexion shelving stacked with boxes full of scraps of material, bits of wool, ribbon, boxes of boxes and tins that I just KNOW will come in useful one day, likewise jam jars, screw top bottles, coffee tins and pretty paper, paper bags, net bags and SO MANY cake tins of buttons…..but you seem to make time to actually DO things with it all, whereas I only seem to just get as far as the collecting of it! I am trying to be disciplined! I love using leftovers from projects to make hexipuffs! It’s like having a record of everything you’ve made. I’d love to make the hexipuffs only out of oddments so that, like any traditional patchwork quilt, it will be made from memories. Aren’t hexipuffs addicting to make? Each so quick, yet satisfyingly complete in themselves. They really are… I’ve made 17 in less than a week. I’ve had to stop temporarily as I’ve been asked to knit a squirrel! You lot are on my wavelength! I have started ‘puffing’ to use up all my wool oddments,. So far I have 32 and I have got it down to 45 minutes to complete one. Problem is that I am fast running out of wool oddments so I have just come on line to see if I can buy bags of oddments. Has anyone tried oversewing with the designs on the Ravelty site? I have done a bee and a collie dog which are fun and useful to decorate those boring plain coloured ones. Keep puffing!!. I decided to leave my plain puffs plain because I have so many crazy ones knitted out of self-patterning sock wool and I think the final quilt will be overwhelming if I do too much extra decorating. 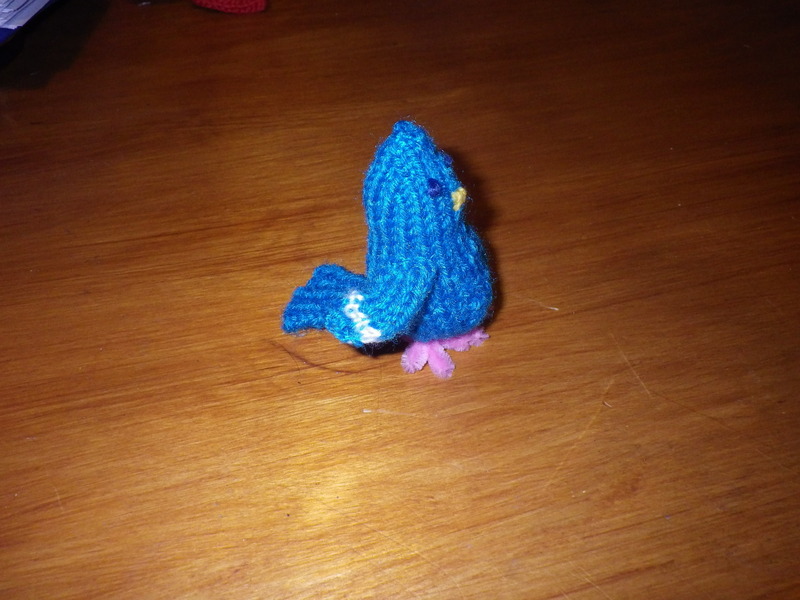 That said, I have knitted quite a few plain ones recently and they do seem to be asking to have something done to them! As for oddments to buy – try e-bay and freecycle, A friend of mine got a bag of wool from the latter but only wanted the DK, so gave me all the finer stuff, it’s really added to my stash! Thanks, I will try them. I am not too worried about ply. I am making my puffs in double knitting and thinner stuff works well using 2 or 3 strands, especially if they are all different colours. Great – large puffs… your quilt will probably be done way before mine! 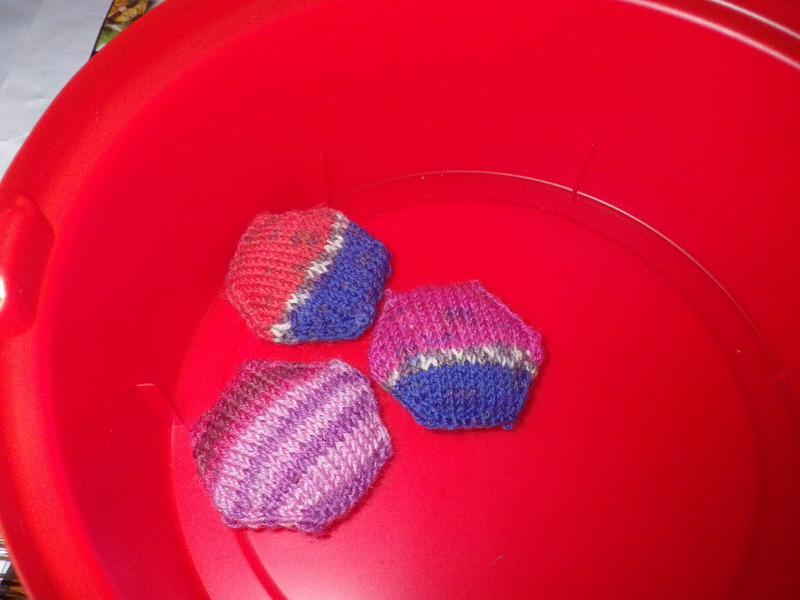 could i make the hexi puffs with knitting needles, not the double ones. I can’t use the double ones. I don’t mind sewing. I don’t see why you couldn’t knit each side flat and then stitch them together, but I’d personally hate that amount of sewing! I tried this and they seemed to lose their shape when I sewed them together. Have you tried circular needles?